Today turbochargers are important components in modern engines. They have an important key function to boost the performance of petrol- and diesel engines. Every turbocharger concentrates the air which is going to the combustion chamber of the engine. This process increases the efficiency of engines and save fuel and emissions too. In this E-Book you can find all the necessary information about the general function of turbochargers, working with a force cartridge to regulate the airflow on the turbineside. Those devices are explained detailed and solutions to correct malfunctions and main failures are discribed and illustrated, so that they can be repaired by your own. Lots of Turbochargers have sporadic problems with the boost pressure. This failure occures during a ride. Sometimes the control unit of the car indicates a Diagnostic Trouble Code (DTC). 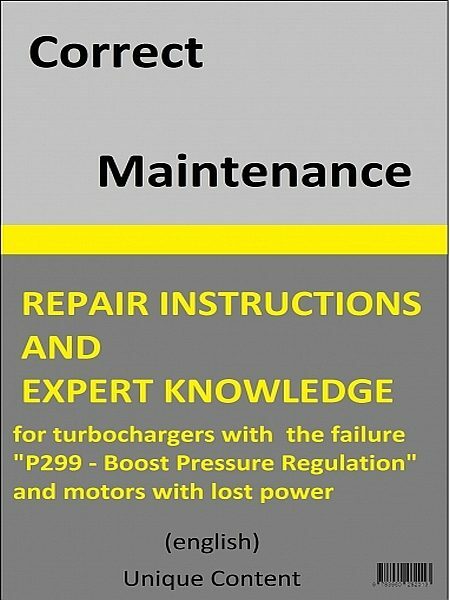 You can find all the needed information in this E-Book to avoid the exchange of the turbocharger and save much money. This motor is only an example and the information of this E-Book can be used for every turbocharger which works with a force cartridge on the turbine side. In this case the manufacturer and also the type of motor is not relevant. This motor is only an example. The knowledge of this E-Book can be used for every turbocharger which has a force cartridge on the turbine side. The manufacturer and also the type of motor doesn`t matter.